European Secret for beautiful ageless skin. Cleopatra (69-30 BCE), last Pharaoh of Egypt (and of Greek descent), and her scientists, first discovered the ageless secret to a youthful complexion. She knew that to retain control over her kingdom, she had to hide her aging. Cleopatra and her scientists discovered the power of water for ageless, younger skin. Cleopatra was the first woman to truly understand that your complexion is your signature from the moment of birth and throughout your life. Cleopatra knew that water is the secret to beautiful skin, she knew how to apply make-up and she knew that her appearance gave her strength within her kingdom. The Secret and Truth for Beautiful Skin. The secrets truth about skin care, Sharon discovered, is that make-up, soap, and environmental conditions encountered daily, can cause dry skin. Here is the secret, known to the world's most beautiful women: Skin is 80% to 90% water. Beautiful skin is moist skin and moisture is water. Dry skin constricts blood capillary flow and makes skin appear pale. The paleness also causes cosmetic colors to look dry and faded. The only known rare secret water that is 100% skin compatible is the Bio-Logic Aqua® tissue culture water in Nature's Mist® Face of the Water®. Most tap water is alkaline (pH above 7.0) and not beneficially absorbed by skin (which has a pH of 5.5 to 6.5). The pH of Bio-Logic Aqua® is a skin compatible 6.49. Research by Sharon Kleyne and others have proved that heavy, alkaline minerals in water are drying to skin and that lighter, acidic minerals are more beneficially absorbed and retained. The secret of moisturizing lotions. Water content is critical to healthy, beautiful, youthful skin and only 100% water can increase skin moisture content. "Moisturizing lotions" do not add natural water to skin. Moisture is water, not lotion. Companies that manufacture skin lotions may not always tell the whole truth; but dermatologists know that the benefit of "moisturizing lotions" is not to add water but to help seal in existing water. Water must always be applied before crèmes, lotions and potions. Nature's Mist® Face of the Water® is 100% water and should always be applied immediately prior to skin lotions, cosmetics and any other topical skin application. 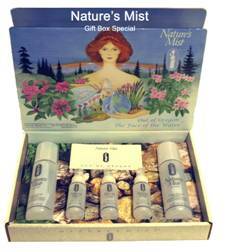 Nature's Mist® Face of the Water® increases the life and appearance of cosmetic colors. Normally, cosmetic colors fade after a few hours. A quick mist with Nature's Mist® Face of the Water® instantly revitalizes cosmetic colors, and your own beautiful skin tones, for a healthier, more natural look. Sharon Kleyne invites you to contact her if you have any questions or feedback. Her weekly radio show, Sharon Kleyne Hour Power of Water, can be heard any time on World Talk Radio, Apple iTunes, Green Talk Network and Voice America.